No Frills presenting you ultimate unbeatable products. Until 7th Jan you can find lower food prices in nofrills shop. No Frill discounts are like a monster punch ! Just check all off these five page and ready for shock ! nofrills slogan is WON’T BE BEAT they are right. 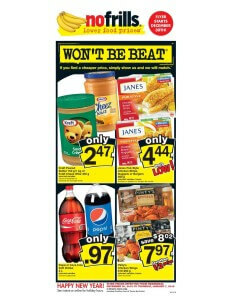 According to catalogue best discount on Pepsi or Coca cola soft drinks from $0.97 for 2 Lt. Are you searching something delicious and crispy, I can recommend you Janes pub style chicken breast strips and breast nuggets. First of all you have to heat them and after that enjoy the flavor of nuggets or strips. Fresh chicken and crispy outline will makes you happy at all ! 800g one pocket and its enough for one dinner. Critical point is price of this product ; its just $4.44. THAT’S LOW ! Mmm chicken wings looks perfect. Pinty’s wings cheap and tasty, you can find them at frozen fridge. In this week there is two different type butter awaiting you on shelves with amazing price. Kraft is best company about peanut butter. You can have great breakfasts if you have Peanut butter. With amazing taste you cant stop to eat this every morning. 450/750g & 1 Kg varieties at store.